The weekend after my last post we went away to Winter Park. After that, 2 conferences kept me in Palm Springs for almost a week. Then I spent the bulk of this weekend setting up a new laptop for Dorinna (and cleaning up 2 old computers). Enough excuses? The day before the Oscars, Dorinna and I hosted a dinner party for a group of international business partners who were in town for our user’s conference. 1 Dutchman, 2 Germans, and an Italian joined us for… Mexican food. The next day 2 of the Europeans flew home, but the rest joined me for a mountain expedition (or should I say Bergtour?) 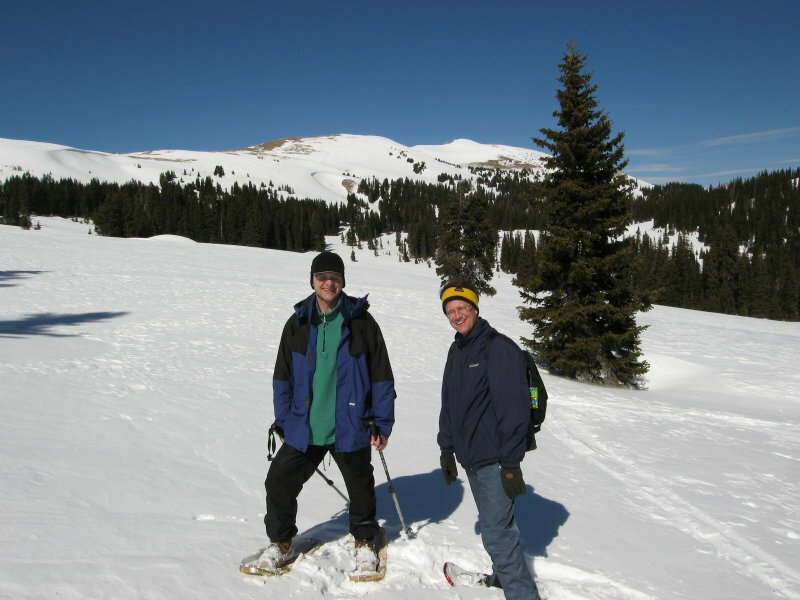 Our two pairs of snowshoes went to our friends Gerald Kreuwel and Christian Kustos. I brought my tele-skis, which worked well enough. 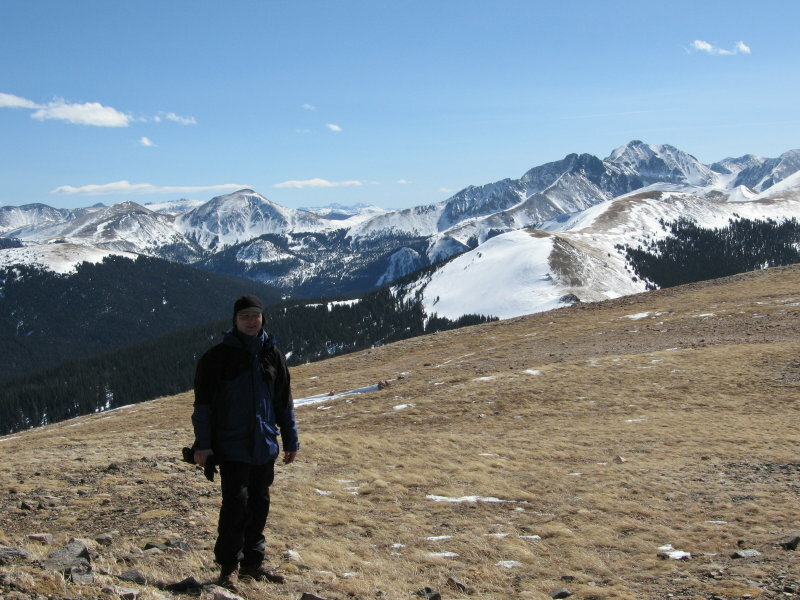 My plan was to hike up to the top of Montgomery Pass. I like the fact that treeline is less than 2 miles from the road. Here are Christian and Gerald at the Baumgrenze. Well, we hiked up to the pass and looked up at the ridge extending in front of us, cleared off snow by the constant winds. Christian, eager to do some real mountain-climbing, convinced us to keep climbing to a small peak topped with a radio tower. It’s actually in the middle of the picture above. My bad cold really slowed me down, but we made it to the summit. The map shows this as an unnamed peak, so I have dubbed it the Kustosberg (Christian’s last name is Kustos). Here’s a shot of Christian at the top, looking in vain for the cross that tops just about every significant peak in the Alps. Nokhu Crags and the Never Summer Mountains are in the background. It had been a few weeks since Colorado got any snow, so skiing conditions on the way down were an interesting mix of crusty ice mixed with patches of soft powder. 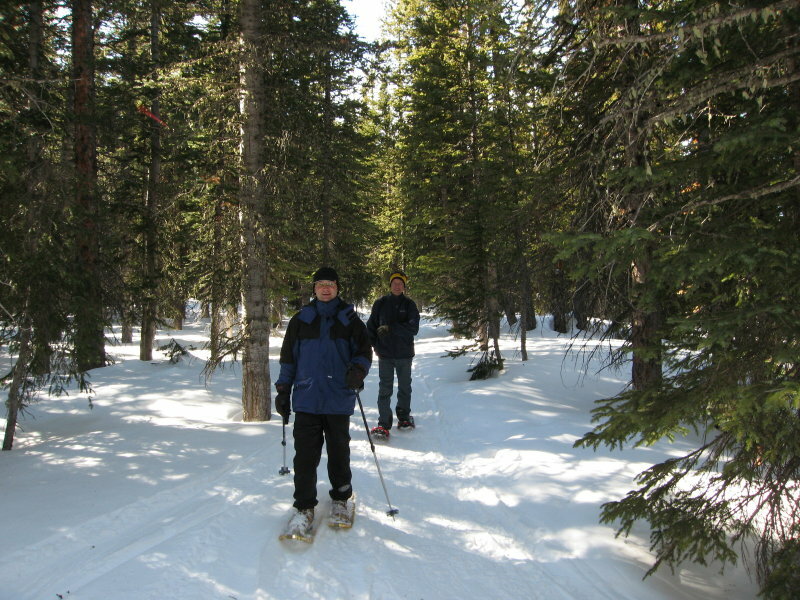 It didn’t bother the snowshoers at all, but with skis it was fairly (ahem) thrilling. This was Christian’s first trip to America, so it was fun showing him some of our Colorado landscape.